Honda announced on Thursday that it’s recalling 250,000 vehicles globally due to dangerous braking problem. The recall affects several models including the Honda Odyssey, Honda Pilot, Acura RL and Acura MDX, all of which were built between 2004-2005. Honda is recalling roughly 183,500 vehicles in the United States and about 57,000 in Japan. Over 9,000 vehicles in Canada, Australia, Mexico and Germany are also involved. Thursday’s recall concerns the stability assist system, which may malfunction and cause the brake to operate even when the driver is not pressing the pedal. Aside from unintended brake deployment, affected vehicles may also brake more strongly than intended when the stability assist system fails, according to Honda spokeswoman Tomoko Takemori. If such an event occurs, the likelihood of a crash and/or injury is greatly increased. Honda has not stated where it received the problematic parts from or how much the recall will cost. Additionally, the automaker has not released a recall schedule outlining when owners can expect to get a recall notification. According to Honda, there have been no accidents or injuries reported. In the meantime, owners may contact Honda at 1-800-999-1099 or visit owners.Honda.com for more information. Concerned drivers may also contact the National Highway Traffic Safety Administration’s Vehicle Safety Hotline at 1-888-327-4236 or visit www.safercar.gov. Honda’s brake recall stems from a NHTSA investigation that was launched last October. The probe included 88,000 2005 Honda Pilot SUVs. Although there have been no injuries or crashes reported in relation to the issue, the NHTSA and Honda have received 205 complaints. One Honda Pilot owner reported that his vehicle stopped three times without warning, including once on the highway. The driver proceeded to bring his SUV to the mechanic, but the problem could not be duplicated. The mechanic did state, however, that faulty brake controls were a likely cause. “If we continue driving the car, we are scared we may injure ourselves or other drivers,” wrote the driver to the NHTSA. No stranger to substantial brake recalls, Honda recalled more than 870,000 minivans and SUVs last December because of a roll away risk. The recall impacted 277,000 model year 2003-2004 Honda Pilot SUVs and 347,000 Honda Odyssey minivans, as well as 247,000 model year 2003-2006 Acura MDX SUVs. A failure in the vehicle’s locking mechanism, which is supposed to secure the key in the ignition, was deemed the cause of the problem. Similar to today’s recall, last year’s recall resulted from an investigation by the NHTSA. The federal government launched the probe after receiving 43 complaints of vehicle roll away, 16 of which resulted in crashes. 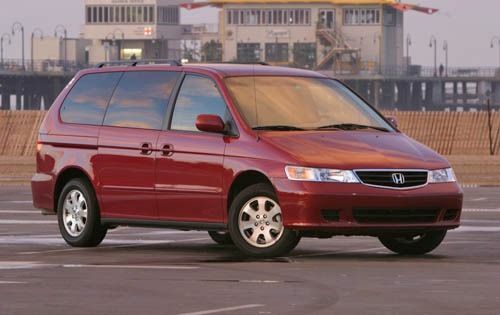 In one severe case, a Honda Odyssey driver reported that he suffered a broken leg after being run over by his vehicle. “I had an open fracture on my fibula (lower leg bone) and crush injuries on my shin area,” the driver wrote to the NHTSA. Stay tuned for more information regarding Thursday’s recall, including a recall notice schedule update.